After a comparatively dry 2012 (2830ml), this year's "wet" season is off to a good start. 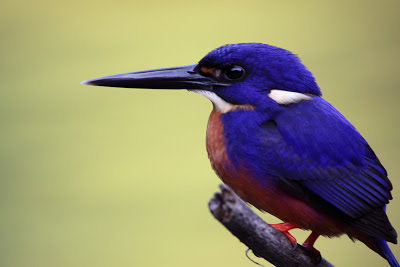 A monsoonal low on Cape York is bringing good rains to the Daintree (200ml+ in the past 4 days), filling the wetlands and flushing the Daintree River. No flooding yet but, the ground is now saturated so, continued heavy rains will cause local flooding. 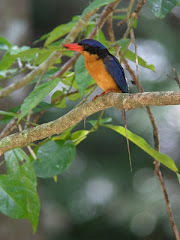 Excellent for birding though, with Pale-vented Bushhen frolicking in drains along the side of the road, Red-necked Crake calling at night and both Little and Azure Kingfishers returning to their traditional spots (including Red Mill House pond) after the breeding season. 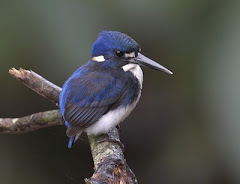 A visit to Maardja Boardwalk last week gave us two sightings of Little Kingfisher, and three separate sightings of Southern Cassowary were reported yesterday north of the Daintree River. A large flock of Wandering Whistling Duck (40+) flying over Daintree Village each evening, and several hundred Magpie Goose are still in the area - roosting near Barratt Creek and feeding in the fields throughout the valley. The perils of the rainy season, unfortunately, are obvious. The Papuan Frogmouth nest we have been watching has had a large branch fall on it during the rain. We are not sure of the result.